Royal Caribbean's Deluxe Beverage Package is the cruise line's unlimited alcohol offering for guests to enjoy a wide variety of drinks for one fixed price. Since Royal Caribbean revamped its unlimited alcohol packages in September 2016, there is now one unlimited alcohol package for guests who wish to "have it all" and lock in their price. Beer, wine, cocktails, coffee, water and more are all included in this package and purchasing the deluxe drink package means you will know your cost for drinks in advance and be able to lock it in now. You can read more about what the different unlimited beverage packages are and how they work. What does the deluxe drink package include? Guests can choose between unlimited cocktails, beer, wine, non-alcoholic beverages, premium coffee, tea, and bottled water. This package includes drinks with a value of up to $12. For guests that would like to enjoy a beverage over that threshold, a $12 credit will be applied towards the beverage of choice and guests will be required to pay the balance. Guests with Deluxe drink package can also get 40% discount on wines under $100. Wines above $100 will receive a 20% discount. All Beverage Packages exclude any beverages served inside licensed Starbucks stores, such as those on Oasis-class ships. How much is the deluxe drink package? The base price in 2018 is $57-$63 per person, per night excluding the service charge, which will be added to the package price upon purchase. In 2019, the price will range between $63 and $70 per person, per night of the cruise. This means the daily price you pay covers all the drinks in the package as well as gratuity. Often, there are pre-cruise discounts available for guests that purchase the drink package online, via Royal Caribbean's Cruise Planner. Who is the deluxe drink package best for? Guests who want to be able to pick from the widest variety of alcoholic and non-alcoholic drinks will want the deluxe package. Royal Caribbean advertises the deluxe package as having "virtually unlimited options" and that is pretty close to the truth. Guests who can consume a lot of cocktails, beers, coffees, juices and more are well-suited for this package. A common scenario we hear about is a guest who likes to drink a lot of coffee and/or juice in the morning, and then enjoy alcoholic beverages during the day and evening. Can I get souvenir glasses/mugs while using the deluxe drink package? You can get drinks like Labadoozies, Coco locos, after dinner shots or the drink of the day with the deluxe drink package but does not include the souvenir mugs/glasses they are often served in. You should tell your waiter or bartender to get the drink without the souvenir cup to avoid being charged extra for the souvenir cup. Can I purchase the deluxe drink package and share drinks with someone I know onboard? No, sharing beverages on any of Royal Caribbean's unlimited drink packages is strictly prohibited. 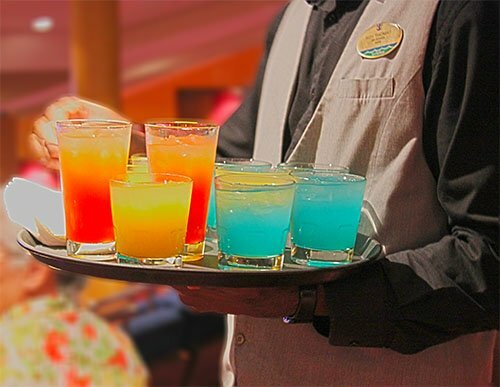 Are Royal Caribbean's unlimited drink packages worth it?